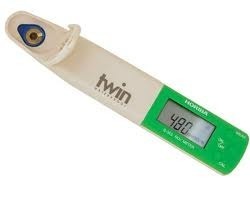 Leading Manufacturer of nitrate meters from Ambala. We are one of the strong competitors of the leading firms and are engaged in offering Nitrate Meters. It is basically used to measure nutrient solutions, soils greenhouse soil less media, water samples and tissue sap. Client’s satisfaction is what we work for and that is how we have maintained our credibility amongst them. Our quality experts leaves no stones unturned to ensure the perfect functioning and performance of the product in compliance of set industry rules and norms.